When I threw away my old pruners — which had an irregular cutting edge and a safety catch that always stuck — I promised myself, when it was spring, I’d look for and buy the Mercedes of pruners: beautifully engineered, balanced, responsive. The price would be no issue. I use the tool all the time between April and November, and I even keep it within reach, on a nail I’ve banged into the wall near the garage door. Going out into the yard? Grab the pruners. Spring weather and a free afternoon beckoned me out to the yard today. I put on my sturdy dirt shoes and raked up a carpet of wet leaves. I needed more! I wanted to cut something. Alas, I had no pruners and no desire to head to a specialty store to comparison shop for high-end ones. I headed instead to the nearest hardware store, about two miles away in West Roxbury. First I grabbed some leaf bags. Then I asked the guy at the desk, as I made an odd, pincer-like gesture with my right hand, “Got any, uh, you know, clippers?” (Why the gesture? Why the vocabulary loss?) He pointed; I found the gardening aisle. My eyes scanned the price stickers first, looking for the most expensive pruners. They were ugly, and the handles were coated with that spongy foam I find so annoying. I looked again, searching for design features. My eyes landed on these, and lingered. 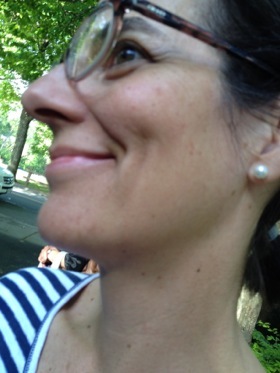 I instantly liked them: clean, streamlined, unadorned. And yet… they were so cheap, only $7 or so in a long line of higher-priced choices. Would low price turn out to mean low quality? Well, I took them home anyway, simply because I liked them so much. It turns out they are sharp, easy to handle, and effective. My favorite detail is the safety catch, which is the metal hinged piece at the bottom that opens and closes like a gate and latches ingeniously. The manufacturer is True Value (item #680043): no snob appeal, just a well-made simple machine. Now I want to go buy a pair just like that. 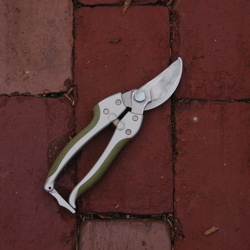 And I do have the Mercedes of pruners, a Felco #8 which cost, like, fifty bucks and which I habitually take with me when I go out into the yard (unless it’s just to let out the chickens). The Felco is fabulous, but it might not be any better than the True Value, and the look of that tool is classic. Up in Prince Edward Island I have a couple of pairs of pruners that were cheap in the first place and are now also old and beat up. They work. There’s much to be said for simple, inexpensive, basic design that works. Once I dug up an old pair of pruners in the yard where I was living. They were designed rather like the True Value (including the keeper or “gate” at the bottom) and covered with a priceless patina of rust, and once I cleaned them up they worked. Somehow I lost them later. Still bugs me.